This is the debut CD by Nicklaus Hill and the Univerzals. I have previously reviewed some of their demo CDs, of which some of the tracks appear on this CD. The CD features 12 tracks (78 minutes excluding the 5 minutes of silence in the last track) of a wide mixture of music, which in general you would have to put in the category of world pop ska psychedelia. Ska is the major influence on the music this is not just any ordinary ska music as it takes in all sorts of influences into the melting pot. The CD is housed in a beautiful digipack with really nice and spacey artwork. The CD starts off with the 61½ minute track Spellbound and a beautiful sax solo and some spacey keyboards before the world music kicks in and you are transported away to Turkey or somewhere. Great song. 7th Galaxy is a more accessible ska track with some cool horn playing and very conscious lyrics. Princess of Angels is another more mainstream track but also a bit spacey and with a laid back groove but still that ska like guitar and horns. Message from Eternity features a really nice guitar solo by Nick. Through the Valley of Fears starts very slowly and then just jumps out and heads into ska madness. Here is where the CD leaves the ska behind head into a different direction. Spiritual Revolution is a cool track with a heavier guitar balanced against the horn section to start the track before it enters into psychedelic rock track. Glass Skyscraper is my favourite track on the CD. I just get sucked into the beat, the cool psychedelic aspects of the track and way he sings. Morning Star is a short and beautiful and dreamy song with some really nice guitar. It features a female vocal (Mizgin) to help transport you away. Under the Waves features acoustic guitars and is a spacey track as well. 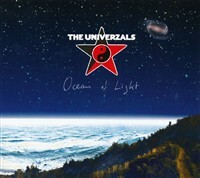 Ocean of Light is a very cool 10½ minute track. It starts very slowly and around 5 minutes an amazing saxophone solo is played as the band just drifts in the realm of Pink Floyd. East of the Sun is an uptempo psychedelic rock track. Beyond the tip of your Nose, finishes off this pretty impressive CD. This track has great lyrics, cool groove and bass line, and nice horns. If you are patient and can wait for the 5 minutes of silence you can hear a really cool hard rocking track with intense female vocals. Wow.. Excellent debut!